The Avalon Fly is the result of scientific and technical research, which lasted for years. Brian O'Keefe with a large Cuban Permit. 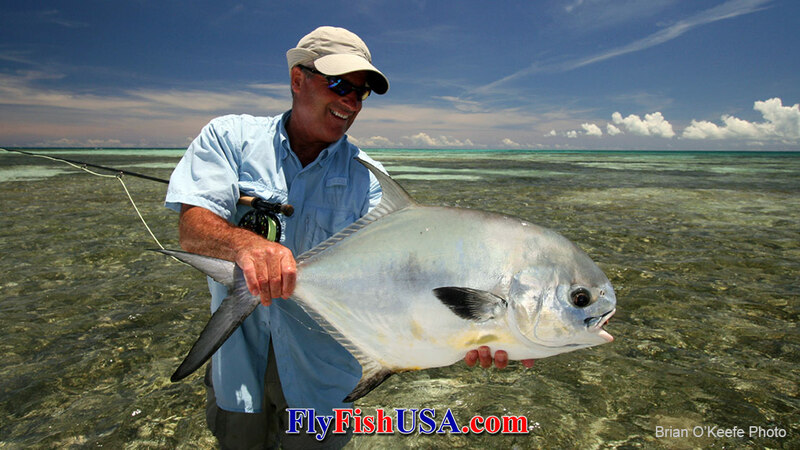 Mauro Ginevri shows off his wildly successful Avalon Permit Fly. The Avalon permit fly is the result of many years of intensive research. Since 2000, Mauro Ginevri has fished diligently for permit, using mostly crabs and shrimp patterns that were tied by the world's most famous saltwater fly tiers. Many flies also were given to him by the guests, but due to lack of success, he began tying his own flies in 2001. 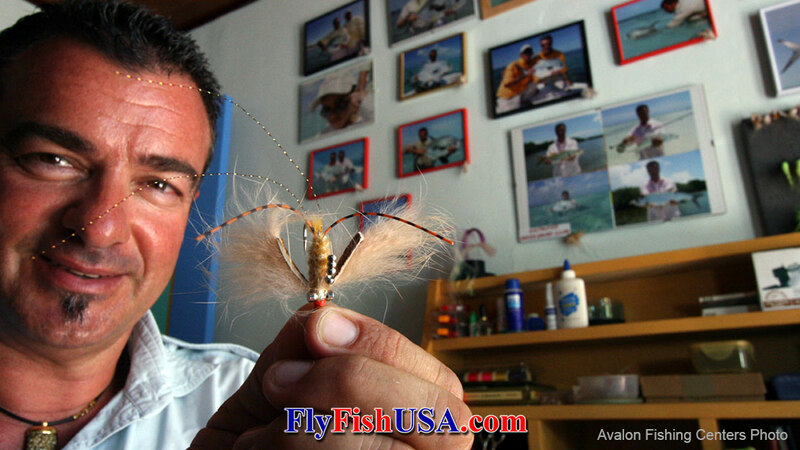 It was not easy for Mauro, with hardly any fly tying materials and tying tools available. He learned his fly tying techniques by studying books and magazines that were left behind by the fishing guests. His real tying skills however, first started to develop when he took flies apart in the opposite way that they had been tied, to study the special techniques that the big masters were using. His eagerness, enthusiasm and fanaticism for fly tying did the rest. Today, his biggest hobby is tying bonefish, permit and tarpon lies. Meanwhile, completely addicted to fly tying, Mauro had only one thing in mind. He wanted to increase his catches with a pattern that could really catch permit instead of spooking them. He also wanted to prove to himself that he was correct in his thoughts and strategies regarding permit that came to mind during all the intense research work. Finally, he wanted to design a fly that not only works in Cayo Largo, but in other locations in Cuba as well. It meanwhile became an obsession for Mauro to develop a pattern that sinks with a harmonious and elegant movement, while the hook stays upside down at all times, regardless of any retrieval speed. The solution came from the swimming pool near of Mauro's tying room. He started to design and develop many creations, and each of them went through serious and intensive tests in the swimming pool, observed by snorkeling, and retrieved or stripped at different speeds by one of the guides. While being underwater, Mauro studied the action, position, mobility, sinking speed, and behavior of each fly. The guides were a great help and they gave Mauro a lot of suggestions and tips for improvements. Each prototype that passed Mauro's tests were further tested at the permit locations by Mauro himself, the guides and even dozens of customers. The Avalon Permit fly is not a crab, but a shrimp pattern, and the main questions is why did Mauro construct his shrimp so long? The answer is simple. Several years ago while Mauro was studying about what kind of food the permit was most interested in at Cayo Largo, he searched the flats and feeding grounds of the permit together with master guide William. Snorkeling and diving was not really the best option to find the food, and therefore they used a little net to search for the available food. The reaction of the permit, when the fly has been successfully launched, is to attack and take it without hesitation, just without suspicion. The Avalon web site Claims 800 permit landed with the Avalon Permit Fly. Bonefish and tarpon also eat this fly. You better have some Avalon flies if you are headed to the Carribean.